Receive photo tips and information to benefit and inspire photographers of all levels. 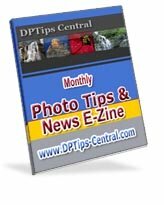 The DPTips-Central.com offers inspirational ideas and practical advice on all aspects of digital photography. We will also give you a FREE Guide to Buying Camera and Other Equipment which you can download right away! You can unsubscribe at any time, and your email address will never be used for anything other than this newsletter. Enjoy Photo Tips and News E-zine... and have fun !